A driver described as an 'elderly woman' accelerated while pulling into a parking spot in front of a Bethlehem, Pennsylvania, Dunkin' Donuts and crashed through the entrance today, injuring five people, according to LehighValleyLive. The driver's car came to a rest inside the shop in front of the cash registers. "On Nov. 21, 2006, a 59-year-old woman was killed when a car crashed into the front of an Allentown jewelry store. Joan E. Zamborsky, of the 900 block of North St. Lucas Street, Allentown, died shortly after being struck by a car at Bixler's Jewelers in the 3100 block of Tilghman Street. Three other customers were hospitalized. 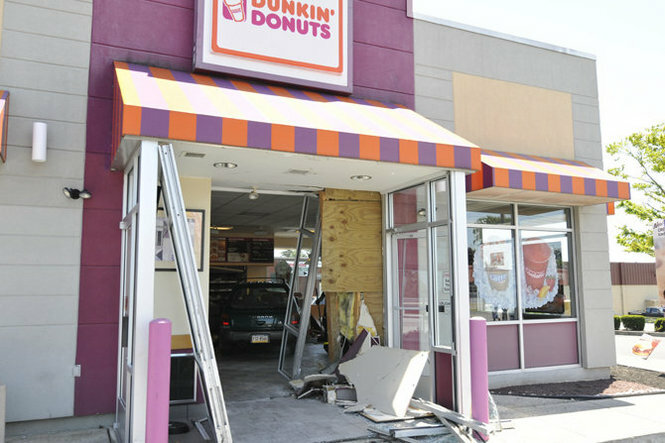 The driver, 82-year-old Sung Yeung Kam, of Allentown, and store employees were uninjured, police said." "On Feb. 25, 1999, Chantal Rodriguez, 2, of Whitehall, died after an automobile crashed into La Fontana restaurant at 960 Broadway, a Fountain Hill pizza shop owned by her father, Chavez "Chance" Rodriguez. Two other restaurant patrons were injured in the crash." Thanks to Rob Reiter for the heads-up on this accident. Vunleralbe stores should install strong metal bollards in front of their storefronts. They don't have to be terribly big, or unattractive. Problem solved?